32" ROTARY TILLER. 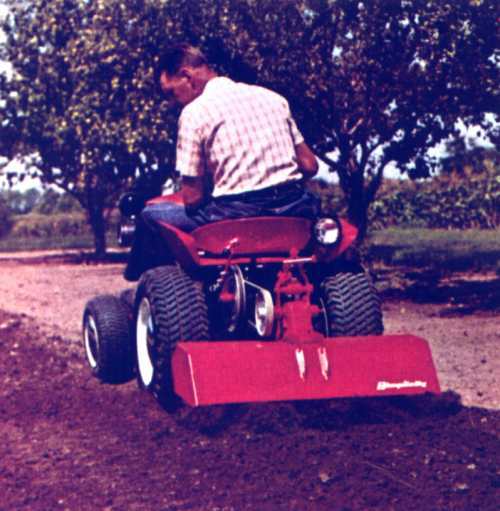 Gentle blending action prepares ideal seedbeds, since it never pulverizes soil structure. Strong, non-clogging, self-sharpening tines. High-low range speed kit can be effectively used to reduce ground speed. Precision anti-friction bearings. Hydrolift lever raises tiller when desired. (Recommend No. 990223 front counter weight for balance when using hand lift lever.) Pulley Kit reduces tractor speeds. (Tine Extensions Optional.) Mfg. No. 990392.